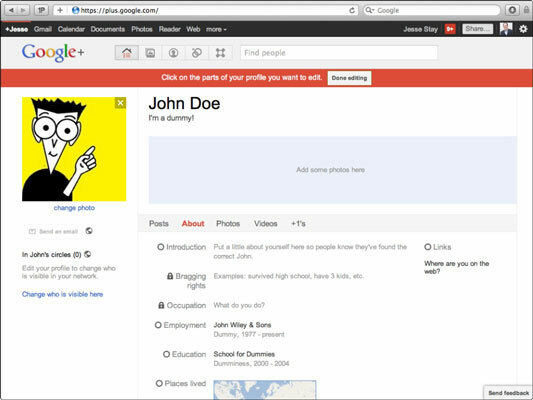 The About page on your Google+ profile is the tab that people first see when they’re visiting your profile. This tab tells friends and contacts more about who you are, where you’re from, and anything else you feel like sharing. The options on the About page are optional, but the more Google knows about you, the better recommendations Google+ can provide for you. To edit this page, go to the About page and click Edit Profile. Then click on the text you’d like to edit and it will magically turn into an edit box! You will see two modes on your profile: Edit mode and View mode. Clicking Edit Profile takes you into Edit mode, which allows you to edit anything you click on in your profile. Click Done Editing when you want to go back to View mode. Introduction: This is the first statement people see about you, so make it good! Write a paragraph or two describing what you do and what you want people to know about you. Bragging Rights: What is your claim to fame? Maybe you invented the Internet. Maybe you kissed Shamu the whale. This is where you can share something witty or maybe even something factual that people should know about you. Make people laugh here! Occupation: If you filled this out before, you shouldn’t need to fill it out again. If you need to add more work or perhaps you didn’t complete it, now is the time to add more jobs. Employment: You also may have filled this out earlier. This is the list of companies you have worked for in the past. Education: If you didn’t fill this out before, add the schools you attended here so Google+ knows to recommend others who attended the same schools. Places Lived: Also good for Google’s recommendations, this is a great way to show others where you’re from or where you’ve lived. If you don’t think this is interesting, just don’t fill it out and it won’t appear. Options for editing your About page. Home: This is a great way to use your circles. For example, set this to a Friends and Family circle and now your close friends and family can easily find out how to contact you at home. You can add a phone number, e-mail address, postal address, fax number, and a few other options to help your friends find and contact you. If you limit an option to a specific circle, only the people in that circle will see it. Work: You may want this to be a little more public than your Home information so that your clients or coworkers can find you. Here you can enter a different set of information about how people can contact you at work if they need to. Just like the Home information, you can also leave this option blank if you don’t want to share it with anyone (or set it to the Self circle). Relationship: Who knows? Maybe that special someone is on Google+ and just might find your profile and notice you’re single. Here you can choose your marital status. Google, being as diverse as it is, has a plethora of options to choose from. Looking For: Similar to Facebook and other social networks, here is where you can say what you’re trying to get from Google+. Maybe you’re using it for dating. Maybe you just want to network with others. Or you can just leave it blank and let people guess — you choose. Gender: This is pretty simple: male, female, or other. Some people take issue with the lack of choices in today’s environment, but for now at least those are your options. Other Names: If you have a maiden name, put it here. If you’re known by another name (or two), put those here. Chances are that this option will become more useful in the future. Nickname: What do you go by? This is where you can specify what everyone calls you. This item will likely become more useful as well, as Google+ begins to adapt personas and ways you can represent yourself differently to different people. Search Visibility: Don’t want anyone to know you’re on Google+? Uncheck this box and you’ll remain incognito to people searching for your name. Want to keep your old high school buddies from finding you? This may be a good way to prevent that from happening. Just as when setting up your basic Google+ profile, you can choose who sees any of the preceding options by selecting the circles to which you want those options visible.